Discover South Africa and Zimbabwe in a small group, fully-guided journey. 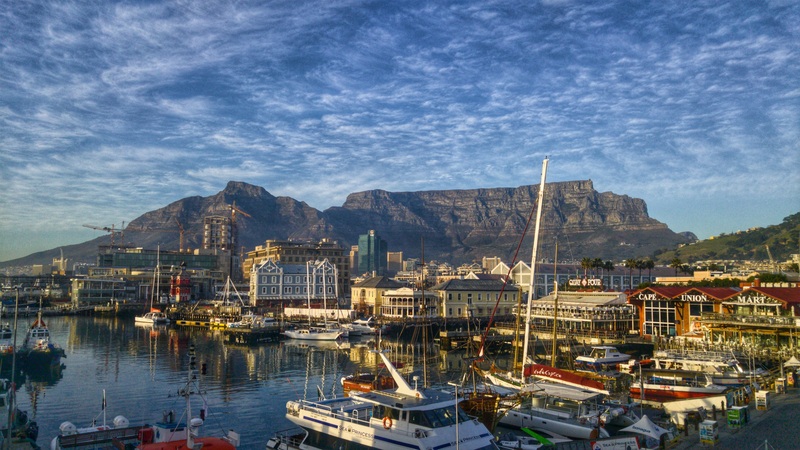 This 15-day itinerary starts in the captivating city of Cape Town where you will spend a few days exploring the city and its surrounds. From Cape Town, we will travel to Victoria Falls where we will spend our time in luxury safari lodges in some of the most breathtaking and unique surroundings including Hwange National Park and Zambezi National Park. Experience firsthand the heart of South Africa combined with the beauty of Zimbabwe with us! Please Note: Cape Town, Hwange Safari & Victoria Falls will include a local guide in Cape Town & Rangers in Zimbabwe only for 2-5 confirmed guests. This trip will operate with Nadia Eckhardt as Tour Leader with a minimum of 6 confirmed guests. Day 01 (Nov 05): Arrive to Cape Town. Meet & Greet and transfer to the V&A Hotel, BB. Day 02 (Nov 06): Full day tour including a driving tour of Cape Town and visits to Table Mountain, Kirstenbosch Botanical Gardens and wine tasting at Groot Constantia & Beau Constantia. Overnight at the V&A Hotel, BB. Day 03 (Nov 07): Full day Cape Point & Peninsula Tour including Boulders Beach Penguins and Champan’s Peak. Overnight at the V&A Hotel, BB. Day 05 (Nov 09): Fly Cape Town, South Africa to Victoria Falls, Zimbabwe. Transfer to Zambezi Sands River Camp, FI. Day 06 (Nov 10): Full day of activities from Zambezi Sands. Overnight at Zambezi Sands River Camp, FI. Day 07 (Nov 11): Full day of activities from Zambezi Sands. Overnight at Zambezi Sands River Camp, FI. Day 08 (Nov 12): Depart Victoria Falls and take the Elephant Express game viewing ‘rail car’ to Camelthorn Lodge for overnight, FI. 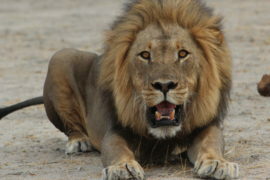 Day 09 & 10 (Nov 13 & 14): Full days on safari in Southern Hwange National Park. Overnight at Camelthorn Lodge, FI. Day 11 (Nov 15): Transfer from Camelthorn and take the Elephant Express game viewing ‘rail car’ to Nehimba Lodge for overnight, FI. Day 12 (Nov 16): Full day on safari in Northern Hwange National Park. Overnight at Nehimba Lodge, FI. Day 13 (Nov 17): Game viewing morning and afternoon in open 4×4 Safari vehicles in Northern Hwange National Park. Overnight at Nehimba Lodge, FI. Day 14 (Nov 18): Transfer from Nehimba Lodge to Gorges Lodge in Victoria Falls for 1 overnight, FI. 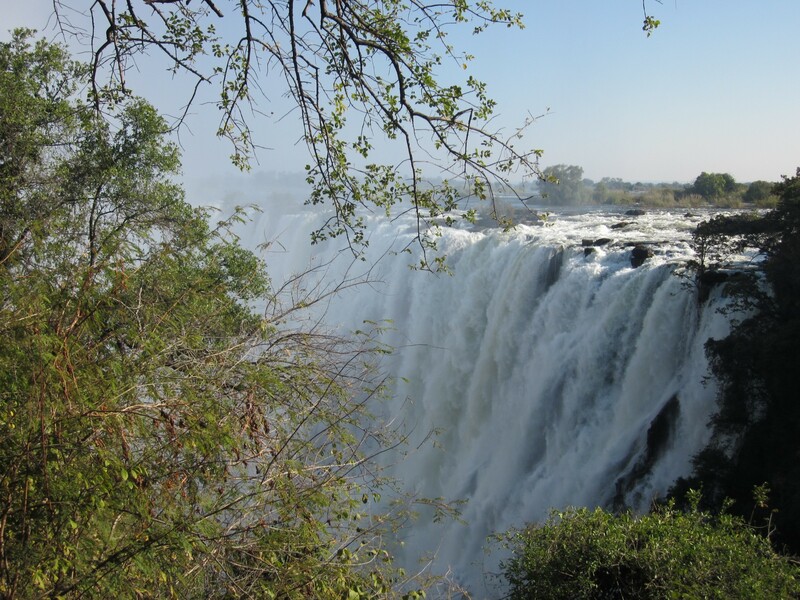 Day 15 (Nov 19): Transfer & fly from Victoria Falls, Zimbabwe to Johannesburg, South Africa. Connect with flights home. Interested in more information? Please contact Africa Easy by calling 1-800-617-2319 or click here to e-mail the Africa Easy Team. Arrive to the Cape Town International Airport. You will be met at the door of your aircraft with your name on a paging board and assisted through immigration, baggage collection and customs and make your way to the arrivals hall. You will be met there by a representative (holding a sign with your name on it) who will privately transfer you to the Victoria & Alfred Waterfront Hotel. On arrival at the hotel, check in for four nights in Piazza Facing Rooms on a Bed & Breakfast basis. Dinner tonight (included) at Harbour House. After breakfast at your hotel (included), we will be met by our guide/driver who will take us on a private Cape Town City Tour. The tour commences with a tour of Table Mountain (weather permitting). Enjoy panoramic views over the Mother City and the Atlantic Seaboard with Robben Island in the distance lying sleepily in Table Bay harbour. Then, enjoy a driving tour through the city. Drive past Company Gardens and the South African Museum, the Castle of Good Hope; built between 1666 and 1679 by the Dutch East India Company (VOC) as a maritime replenishment station, the Castle of Good Hope is the oldest surviving colonial building in South Africa. The drive through the city centre would also take you past the Bokaap, Houses of Parliament, the Grand Parade and City Hall from where Nelson Mandela first addressed South Africans after his release in February 1990. Next, we will stop at Kirstenbosch Gardens where a light lunch will be served at the Tea House. The Garden includes five of South Africa’s six different biomes and is world-renowned for the beauty and diversity of the Cape Flora it displays as well as for the magnificence of its setting against the eastern slopes of Table Mountain. Our last stop is at Groot Constantia & Beau Constantia where you will enjoy wine tasting. We return to our hotel upon completion of the tour. Dinner this evening at Baia (included). Overnight at the V&A Waterfront on a Bed & Breakfast basis. After breakfast at your hotel (included), we will be met by our guide/driver who will take us on our full day Cape Point & Peninsula Tour in a private touring vehicle. We will start with a drive via the scenic Atlantic coastline, then to Hout Bay, and over Chapman’s Peak Drive to the Cape Point Nature Reserve. Take in one of the most stunning sights on the planet, the Cape of Good Hope, known as the southwestern point on the African continent where the Atlantic and Indian Ocean meet. Lunch on own account today. Continue the day with a walk along the boardwalk at Boulders Beach, where we will see a lively African penguin colony. After our tour we will be returned to Cape Town for dinner at Millers Thumb Restaurant (included) and overnight at the Victoria & Alfred Hotel on a Bed & Breakfast basis. After breakfast at your hotel (included) we will be met by our guide/driver who will take us on our private full day Harold Porter & Stony Point Penguins Tour. We will travel along R44 with the Hottentots Holland mountains on one side and the incredible False Bay on the other. The first stop will be the Stony Point Penguin Reserve. Located in the quaint coastal town of Betty’s Bay in the Overberg, the Stony Point Nature Reserve is home to a unique colony of African penguins. Stony Point offers the public the chance to see these wonderful flightless birds up close, via the boardwalk through the colony, which allows the public to observe the penguins go about their daily activities in their natural habitat, without disturbing or disrupting them. Also present in the colony are three species of cormorant; the Crowned cormorant, Cape cormorant and Bank cormorant, all of which breed on the outer rocks. There are also Hartlaub’s Gulls and Kelp Gulls which forage in the colony, while the Rock Hyrax, more commonly known as the Dassie, can be seen on the surrounding rocks. The colony lies on the site of the old Waaygat Whaling Station, which was used to harvest and process whale meat in the early to mid 1900s. Remnants of the machinery and infrastructure for this long-defunct industry can still be found at the site. Lunch today (included) at a restaurant & winery in the scenic Hemel & Aarde Wine Valley before continuing on to the Harold Porter Botanical Gardens. This lovely garden is situated in the centre of the coastal fynbos where the flora is at its richest. It encompasses mountain slopes with wind-clipped heathlands, deep gorges with relict forests, flats and marshes with restios, sedges and bulbs, as well as dunes adjacent to the beach with specialized salt-adapted plants. The Garden is renowned for its waterfalls and amber pools. The main fynbos families (proteas, ericas and restios) are present as well as other important families such as irises, daisies and orchids. The Garden boasts red disa (Disa uniflora) in its natural habitat as well as South Africa’s national flower, the king protea (Protea cynaroides). Return in the evening to the V&A Hotel for dinner at the hotel (included) and your last overnight in Cape Town. After breakfast at your hotel (included), we will be met by our driver who will transfer us to the Cape Town International Airport for our flight to Victoria Falls, Zimbabwe. On arrival in Victoria Falls we will clear customs and immigration, collect our luggage and make our way to the arrivals hall. We will be met just outside the arrivals hall by a transfer agent who will drive us in a shared road transfer to Zambezi Sands River Camp. On arrival, we check in for 3 nights in Canvas Suites on a Fully Inclusive basis. Stay includes all meals, local brand drinks, 2 activities per night, return transfer from Victoria Falls Airport/Town, one return shuttle to Victoria Falls town per stay, Zambezi National Park fees and laundry. Activities include: one guided visit to Victoria Falls which utilizes the one return shuttle per stay, safari activities by vehicle, on foot, by boat, canoeing, fishing and a sundowner drift from the camp. Zambezi Sands offers a wealth of picturesque game viewing opportunities – whether you chose to drive or walk – our experienced guides take great pleasure in introducing you to the camp’s pristine and tranquil surroundings. You can even explore the Zambezi River by inflatable canoe or motorized boat. Victoria Falls The iconic town of Victoria Falls, which is affectionately known as “Vic Falls”, is set on the southern bank of the Zambezi River, at the western end of the mighty Victoria Falls. Zimbabwe’s prime tourist destination and a magnet for visitors from around the world Vic Falls has a rich and romantic history. Discovered in 1855 by explorer and missionary David Livingstone, the railway from Cape Town arrived in 1904 and the landmark 198-meter long Victoria Falls Bridge, spanning the immense Zambezi River gorge and linking Zimbabwe with Zambia, was built in 1905. One of the Seven Natural Wonders of the World and a UNESCO World Heritage Site, the Victoria Falls is one of Africa’s greatest geographical features. At 1700 meters wide and over 100 meters in height visitors cannot fail to be inspired and amazed by the sheer size, power and beauty of the thundering curtain of water which can be gazed upon from 16 view points along a network of trails through the surrounding rainforest. Reaching their zenith in April/May, the Falls are at their most powerful and impressive between the months of February and July. At high water the dense plume of spray can rise up to 500 meters into the air and is visible from as much as 20 kilometers away, justifying why the falls are still commonly referred to by their local name of Mosi-oa-Tunya – “the smoke that thunders”. Even during the low water months of October and November when the Falls become dry for much of their length the view from the Zimbabwe side won’t disappoint. With its welcoming small town atmosphere Vic Falls is home to a seemingly endless number of activities – there is literally something for everyone. The world’s wildest white water rafting, canoeing, helicopter flips, elephant back safaris, canopy tours and adventure slides, river cruises, golf and bungee jumping. An impressive array of arts and crafts is showcased by talented local artists in the open-air curio market as well as at a number of gallery’s and shops throughout town. Enjoy early morning tea or coffee on your private deck overlooking the river followed by a sumptuous breakfast in the main lodge. We will spend two full days enjoying the many safari activities on offer from Zambezi Sands River Camp. Activities will be by vehicle, foot or boat, canoeing, fishing and more! Once back in camp relax for an hour or two in your private splash pool watching the game and birdlife on the river’s edge and in the evening head out on a game drive within the park, stopping for evening drinks and nibbles. Back at the lodge, freshen up before enjoying dinner in the elegant main lodge & your overnights at Zambezi Sands River Camp. After breakfast at the lodge, we will be transferred in a shared road transfer to the Dete Ngamo Railroad Station on the edge of Hwange National Park where we will board a one of a kind game viewing train, the Elephant Express! The trip to Camelthorn takes around 2.5 hours and includes game viewing with snacks and drinks along the way! 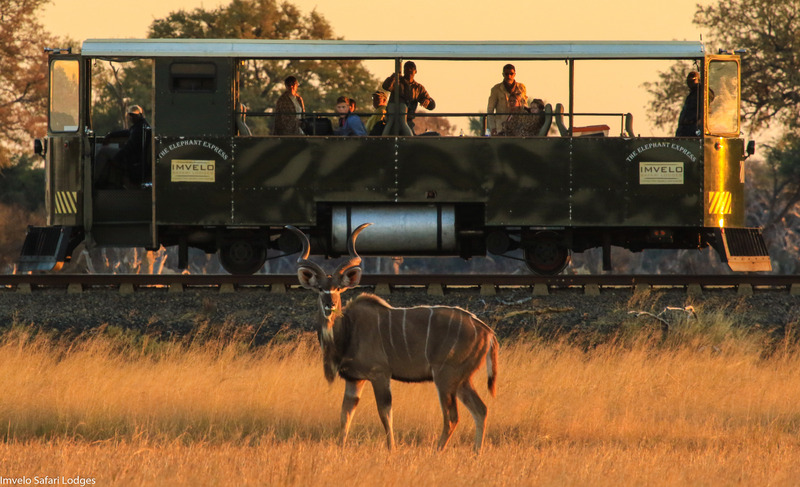 Elephant Express – The railcar carries up to 22 passengers in a safari style carriage with open sides, an engine at the front and back, and specially trained drivers. There is individual seating at teak tables and a chemical loo on board. Soft drinks, wine, beer and snacks are provided and lunch is served whilst the railcar is stationary, before the return trip. There are wide spacious aisles allowing free movement of guests to move about the carriage and spot wildlife. A professional guide is on board to answer questions and make the trip as enjoyable and unique as possible. On arrival at Ngamo Station near Camelthorn, we will be collected in 4 x 4 game drive vehicles for the transfer to Camelthorn Lodge. We will check in for 3 nights in Forest Villas on a Fully Inclusive basis. Stay includes all meals, local brand drinks, 2 scheduled safari activities daily, Hwange National Park fees, return transfers from Ngamo Siding and laundry. Camp activities include: morning, afternoon and night game drives, bush walks, day excursions, hide sits, a school tour (not available during school holidays) and village visit. Next, enjoy sundowners and canapés at our unique Look Up blind at Stoffie’s Pan and the truly remarkable close encounters with wildlife that are a feature of the Look Up. Enjoy a night game drive back to the lodge and then a 3-course dinner beneath a blanket of stars under the Camelthorn tree. Overnight at Camelthorn Lodge. Wake up to the abundance of bird life in the area while sipping freshly brewed coffee or tea and enjoy either a light continental or delicious cooked breakfast in the lodge area. We will spend the days in Southern Hwange National Park with activities including game drives, game walks, night drives, day excursions, hide sits and a possible school tour and village visit. All meals and overnights at Camelthorn Lodge on a Fully Inclusive basis. Hwange National Park – – The oldest and largest national park in Zimbabwe, the 14 650km2 Hwange National Park lies in the north west of the country on the ancient animal migration routes towards Chobe and the Linyanti of northern Botswana. There are no natural watercourses in Hwange which means the game is reliant upon the park’s network of artificially pumped waterholes when seasonal pans start to dry out. 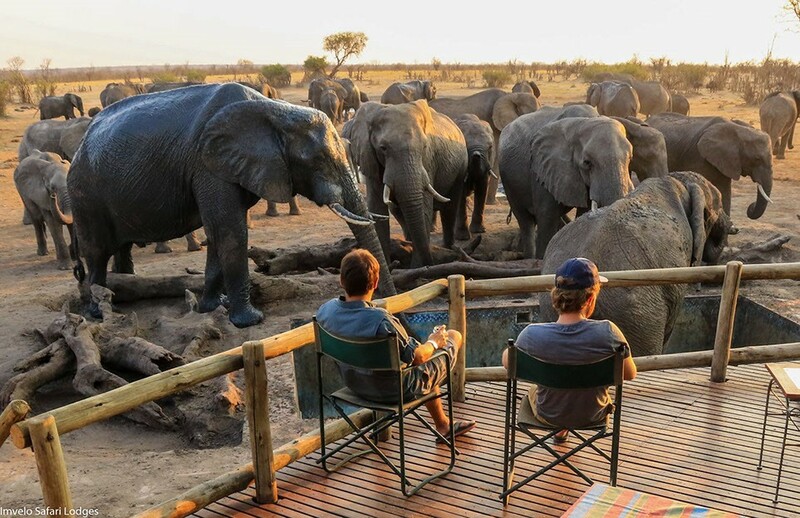 Hwange is a year-round wildlife destination but is definitely at its most alluring between the months of April and October, the dry season, when there are large concentrations of game, especially massive herds of elephant. This time of year is also cooler (it can get very cold in the evening and early morning, although days warm up to 25°C/77°F). The rains, usually beginning in November and lasting through to February/March, tend to take the form of summer thunderstorms rather than lengthy periods of rain. Natural pans and vleis fill up and the game disperses throughout the park, making sightings more sporadic. During this time the south, with its more open plain areas, generally has better game viewing although the north is scenically beautiful, with hills, water lily-filled pans and plentiful bird life. It is Hwange’s varied topography – from arid semi-desert in the west to lush teak forests in the east – that ensures a diverse mix of animal and bird habitats. This extensive wilderness area offers exceptional elephant sightings and supports significant numbers of buffalo, lion, wild dog, cheetah and plains game. Sable and roan antelope are also common and leopard occur in good numbers although are shy and sightings are rare. There are very few rhino left in Hwange and they are therefore hardly ever seen. A notable feature is the exceptional quality of guiding in the park, headed up by Zimbabwean pro-guides, many of whom have returned to the country over the last few years and are amongst the best in Africa. After a delicious cooked breakfast, we will drive about 10 minutes to Ngamo Siding and embark on the Elephant Express rail far for a slow ride up the railway line while game viewing all the way to Impofu Siding. Cool drinks and snacks will be served on board while we enjoy the 2-hour ride. We will disembark the Elephant Express at Impofu Siding where we will board game viewing vehicles and drive approximately 2 hours to the Northwest of Hwange National Park, famed for its large elephant herds and variety of wildlife. Upon arrival, we will check in Nehimba Lodge for 3 nights in Chalets on a Fully Inclusive basis. Stay includes all meals, local brand drinks, 2 scheduled safari activities daily, Hwange National Park fees, and laundry. Camp activities include: morning, afternoon and night game drives, bush walks, all day excursions, a game viewing platform, and a visit to Nehimba Seep and Mandavu Dam. Settle in and start to unwind as you take a seat overlooking the tranquil waterhole in front of the lodge and enjoy the African rustic charm that surrounds you. Relax with sundowners as you watch the game come down to drink in front of the lodge and the heat starts to subside for the day as the sun dips below the horizon. A 3-course delectable bush dinner will be served out under the African sky near the lodge waterhole. After dinner, there will be a night drive on offer around the concession to spot nocturnal species that are just starting their ‘day’. We return for our overnight at Nehimba Lodge. Enjoy two full days with game drives and walks, exploring this beautiful Northern part of Hwange National Park. The north is distinctly different from the southern part both in topography, habitats and species of wildlife. Stop off at the Nehimba Seep for a mid-morning tea break. The seep is an ancient source of water once used by the San Bushmen historically as well as being a place where elephant still dig for water and minerals. Return to the lodge for a leisurely lunch and then siesta or perhaps relax by the lodge swimming pool, frequented by Hwange’s thirsty herds during the dry season. Later in the afternoon, head out on a game drive within the park, ending with cool refreshments and canapés at sunset over one of this area’s famed waterholes. Back at camp, enjoy a relaxing bath or shower to freshen up before a 3-course dinner in the main lodge area. After dinner, relive the day’s safari around the campfire and later fall asleep to the sounds of the African bush around you at Nehimba Lodge. After a last walk in the Hwange wilderness, enjoy a hearty breakfast and then we embark on our shared 4-5 hour road transfer to Gorges Lodge, perched on the edge of Batoka Gorge in Victoria Falls. Two thirds of this transfer takes place in the National Parks and is the perfect opportunity to view game along the way. Drinks and snacks will be provided en route. On arrival at Gorges Lodge in Victoria Falls, we will check in for 1 night in Cottages on a Fully Inclusive basis. Stay includes all meals, local brand drinks, 2 activities per day, transfers from/to Victoria Falls Airport, one return shuttle to Victoria Falls town per night and laundry. Lodge activities include: one guided visit to Victoria Falls which utilizes the one return shuttle per stay, tour of the craft village, local village visit, school tour (not available during school holidays), evening traditional dancing show, black eagle viewing with sundowners and snacks, nature walk along the edge of the gorge with snacks and a sundowner cruise. Settle into your cottage and then maybe relax at the bar soaking up the amazing views before enjoying dinner at the lodge and your overnight at Gorges Lodge. After breakfast and a morning activity (time permitting) we will take a shared transfer to the Victoria Falls Airport and connect with either international flights home or to Johannesburg to connect with your international flight home. Note: The above itinerary and arranged sightseeing is subject to change. Please contact us with your preferred travel dates and goals to confirm your trip. Please Note: This trip will operate with Nadia Eckhardt as the tour leader with a minimum of 6 guests. Under 6 guests there will be only local guides. Please Note: Rates and Flight schedules are estimated and subject to change. Rates are based on per person sharing and are approximate until the time of booking. Rates are quoted in USD and subject to change without prior notice due to circumstances beyond our control; i.e. fuel increases, currency fluctuations, etc. The following scheduled regional flight will be required for the above itinerary. Africa Easy will book this flight for you. Please note: this flight is not included in the safari package rate. We have quoted the airfare separately in the rates section above. Please note: If your international flight is through Johannesburg on August 17th we have quoted a separate airfare rate to include your flight back to Johannesburg from Victoria Falls. International air is not included. Africa Easy can assist you to book international flights into and out of Southern Africa, or we can put you directly in touch with our airline partner here in Seattle (Exito travel) to book international air. Rates are approximate until the time of booking. Please note rates are subject to change without prior notice due to circumstances beyond our control; i.e. fuel increases, currency fluctuations, etc. • Full Day Cape Town City Driving Tour with visits to Table Mountain (weather permitting), Kirstenbosch Gardens (including lunch) & Groot Constantia & Beau Constantia for wine tasting. • Full Day tour to Cape Point including entrance fees into Cape of Good Hope Nature Reserve and Funicular Tickets also lunch and Chapman’s Peak Toll. • 3 nights Fully Inclusive Accommodation at Zambezi Sands River Camp – all meals, local brand drinks, 2 activities per day, transfers from/to Victoria Falls Airport, one return shuttle to Victoria Falls town per paying night and laundry. • Activities include: one guided visit to Victoria Falls which utilizes the one return shuttle per stay (includes entrance fee), tour of the craft village, local village visit, school tour (not available during school holidays) , evening traditional dancing show, black eagle viewing with sundowners and snacks, nature walk along the edge of the gorge with snacks and a sundowner cruise (river usage fee included). Park fees and river usage fees are subject to change without warning. • 3 nights Fully Inclusive Accommodation at Camelthorn Lodge – All meals, local brand drinks, 2 scheduled safari activities daily, National Park fees, return transfers Ngamo Siding and laundry. 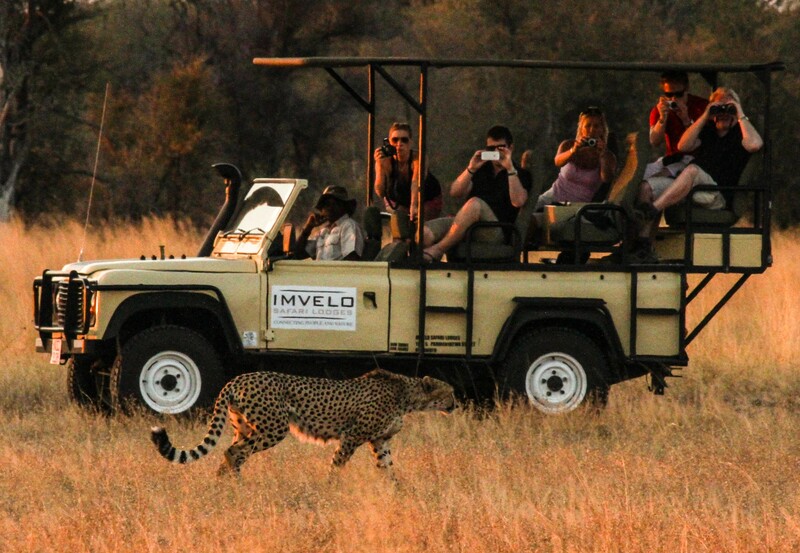 • Activities include: game drives, game walks, night drives, day excursions, hide sits, a school tour and village visit. • One-way safari road transfer from Dete Siding to Nehimba Lodge. • 3 nights Fully Inclusive Accommodation at Nehimba Lodge – All meals, local brand drinks, 2 scheduled safari activities daily, National Park fees and laundry. • Activities include: game drives, walks, night drives, all day excursions, hide sits and night drives. • 1 night Fully Inclusive Accommodation at Gorges Lodge – All meals, local brand drinks, 2 scheduled safari activities daily, National Park fees and laundry. • Activities include: one guided visit to Victoria Falls which utilizes the one return shuttle per stay (excludes entrance fee), safari activities by vehicle, foot or boat, canoeing, fishing, sundowner drift at the camp and village visit. • One-way road transfer from Gorges Lodge via to the Victoria Falls Airport. A completed & signed Africa Easy Reservation Form, along with your 20% safari package deposit and full regional and/or domestic air payment (if applicable) is required at the time of booking. This itinerary is subject to the availability of all services at the time of making a reservation. No space is being held at this time. Please contact Africa Easy for the full terms and conditions that apply. We are happy to answer questions and discuss your trip. 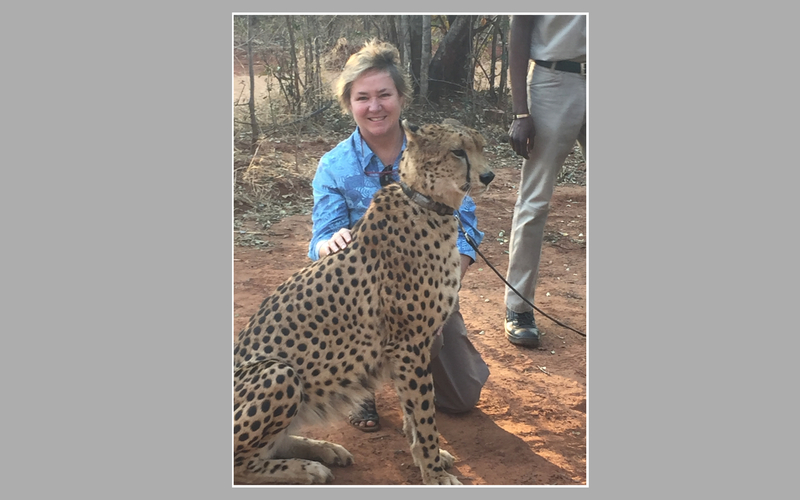 To reserve space on a trip on the Africa Easy website, please contact Africa Easy by calling 1-800-617-2319 or click here to e-mail the Africa Easy Team. Born in Cape Town, South Africa, Nadia now calls Seattle her home. She has traveled extensively throughout the world, Australia, the South Pacific, and more. She spent much of her youth exploring southern Africa and the islands of the Indian Ocean. Currently Nadia divides her time among her home in Seattle, her family in South Africa and is well versed in many adventure destinations, including Central and South America, Indonesia, Africa, Antarctica Africa, and leading expeditions throughout the world for Africa Easy/Expedition Easy as well as for other leading US Tour Operators.